Canadian Overseas Petroleum Limited (AIM: COPL) (“the Company”), an international oil and gas exploration and development company is seeking to raise total gross proceeds of approximately £3.0 million by the conditional placing of 895,523,000 New Ordinary Shares (the “Placing”) at an issue price of 0.335 pence per New Ordinary Share (the “Issue Price”) to new and existing institutional and other investors. 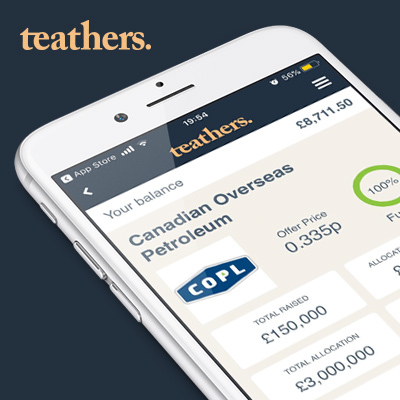 As part of the Placing, Teathers has secured a £150,000 allocation, which will be made available to onboarded users of the Teathers App via a Live Market Bookbuild. The Live Market Bookbuild will be conducted through the Teathers App and will involve the issue of up to 37,500,000 new Ordinary Shares at the Issue Price of 0.335 pence per share. The Live Market Bookbuild will commence at 8am on Friday 17 August 2018 and will close at 5pm on Tuesday 28 August 2018. Settlement is expected to occur on Friday 31 August 2018, on which date contract notes will be issued on completion of the deal. About Canadian Overseas Petroleum Canadian Overseas Petroleum is an international oil and gas exploration and development company currently focused in offshore Africa. The Company is actively pursuing opportunities in Nigeria in partnership with Shoreline Energy International Limited (“Shoreline”) as part of its strategy to generate stable cash flow from secure offshore and onshore assets. COPL and Shoreline, through their jointly held (50:50) affiliated company Shoreline Canadian Overseas Petroleum Development Corporation (“ShoreCan”), have beneficially acquired 80% of the share capital, and have taken over the management, of Essar Exploration and Production Limited (Nigeria) (“Essar Nigeria”). ShoreCan has applied to the concessionaire Nigerian National Petroleum Corporation for formal consent for the change in control of Essar Nigeria, following which Shorecan will be the official registered owner of the 80% working interest in OPL 226. Essar Nigeria holds an attractive oil appraisal and development project in shallow to mid-water offshore Nigeria on its 100% holding in OPL 226. Drilling of the first appraisal/production well is planned to commence in late 2018 to early 2019. ShoreCan is continuing to build a portfolio of exploration and development assets in offshore Africa. To date, ShoreCan has taken a position in Nigeria, and has (in conjunction with other members of its bidding Consortium) been awarded an exploration license onshore Mozambique in the 5th Licensing Round adjacent to the producing Pande-Temane Gas field complex. Negotiations are expected to commence imminently with the Government of Mozambique around the terms of a production sharing contract governing the license. The Common Shares are listed under the symbol “XOP” on the TSXV and under the symbol “COPL” on the LSE. Use of proceeds As at 30 June 2018, the Company had consolidated cash balances of US$1,736,000. The Company intends to use the net proceeds of the Placing to fund the Company’s on-going general and administrative expenses. This principally covers a full technical team including geologists, a geophysicist, reservoir engineers, a drilling engineer legal counsel and commercial and administrative support , which are approximately US$400,000 per month, as the Company seeks to progress its projects in West Africa. Nigerian Development Project The Company is continuing to progress the financing of its Nigerian development project and is responsible for 50% of the costs relating to Shoreline Canadian Overseas Petroleum Development Corporation’s commitment to invest funds in the form of an interest-free shareholder loan to be used for its 80% owned Essar Nigeria operations. In particular, to cover the near term work programme obligations, including drilling one well under Phase-1 of the OPL 226 Production Sharing Contract. As previously announced the Company agreed to a project financing and offtake agreement term sheet, providing for a minimum US$30 million to a maximum of US$50 million Senior Secured Facility (the “Facility”). Once entered into, the Facility will provide funding for all production related expenditures following the drilling and testing of the initial production well to be drilled by Essar Nigeria on its 100% contracted interest in OPL 226. The Placing is subject to customary conditions and the receipt of required regulatory approvals, including the approval of the London Stock Exchange plc (the “LSE”) and the TSX Venture Exchange (the “TSX-V”). Application will be made for the Placing Shares to be admitted to the Official List and to trading on the Main Market, following approval of the Prospectus by the UKLA.